Work/Life Effectiveness | Cleveland Consulting Group, Inc.
CEO, Cleveland Consulting Group, Inc.
For the last two years, I've been working with senior leaders moving into the executive ranks. 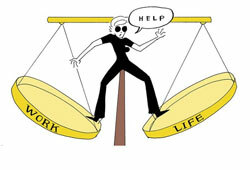 One of the critical issues has been work/life balance. Whether participants in leadership development programs or individual coaching, the interest seems higher than in any of my prior years of experience. Typically, the response has been, "that's nice" and we would move quickly into other more important areas of interest. 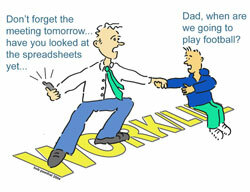 Recently, the interest has led to extended conversations of what is work/life balance. These conversations have led to a more clear conclusion that there is no such thing as a work/life balance for executives. However, there is a self-determined formula for work/life effectiveness. We seem to have created an image that life is in balance in order to "live well". 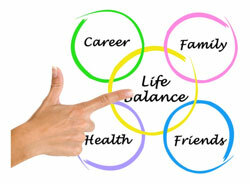 This typically involved determining how to balance or juggle work (career, promotions, self image) with life (spouse, children, hobbies, physical exercise, mental fatigue, friends, health). In many cases, we find that most work a lot and wish a lot for all else. Recently, a client was involved in the succession plan for his employer. As he moved up in responsibility and work related demands, he realized that he was not participating in his two sons lives (at least, not as much as he preferred). He was clear that he preferred to be much more involved than his father had been with him. Through an indepth values analysis over a very reflective one month process, he came to the conclusion that he had to change some core beliefs if he were to include his sons and wife in his life. These beliefs were very deeply ingrained in his psyche about giving priority to work without consideration to the costs to him and his family. Rather, he had made decisions based only on the costs to his career. In changing these beliefs, he came to realize that time is finite for everyone and that once he spent any minute, it was not recoverable. With this insight, we began to explore how to create a work/life formula that was effective for him and his family. He made commitments to attend most if not all of his boys athletic events and to make sure he and his wife had regular dates without cell phones, and the family had at least two weeks of vacation on the ski slopes of Colorado. He realized that he needed to exercise regularly and committed to running 2-5 miles at least 3 days per week, regardless of his workload. Finally, he realized that he had isolated himself from friends and colleagues. He committed to have lunch or other social opportunities with friends and colleagues. He added that he also needed to increase his networking skills. Within three months, the client was experiencing the typical New Year's resolution blues. He had not changed any of his behaviors. We explored the causes. He realized that nothing would change unless he changed how he prioritized time especially when making appointments or commitments to family, friends, and his self. Being that he was already in transition as part of the organizations succession plan, I borrowed from a diagram that I created to clarify how to develop a clearer sense of conscious return on executive time. The diagram had been based on supporting executives to look at how they spend their time in four areas: (1) Managing, (2) Developing, (3) Leading, and (4) Procrastinating. Similar to work/life balance, there is no balance between these four common traps that executives unconsciously set for themselves. Typically, the individual resorts to familiar success behaviors, so they tend to manage and procrastinate more than develop and lead. As the diagram indicates, the executive must find a return on time success formula that is maintained throughout every day. When developing the original diagram, it became evident that many succession failures resulted from chasing time from one appointment to the next. Time was not managed; it managed most individuals. As such, a meta-image was created to support executives to consciously formulate and therefore choose how to spend their time. Each day, an ongoing awareness has to be maintained by the executive on spending less than 35% of the time on managing people, expectations, projects, and details, at least 35% of the time on developing talent, teams, organization design, and culture, more than 50% of the time on leading initiatives, influence, senior and special teams, compelling direction/vison, strategy, and less than 5% of the time spent procrastinating by being lost in details, overwhelmed, lost in emotions, or just "frigging" lost. The percentage totals more than 100% because each individual will find that some days managing and developing are 35% respectively, therefore leaving less time to lead. The critical factor is self-awareness of how one is using his or her time. One of the problems that executives in succession struggle with is letting go of what has been successful. Generally, careers are focused on learning technical expertise for the first part of the career. 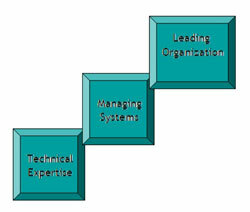 When promoted they rely on creating management systems based on their technical knowledge, if they are to be successful. Finally, as they move to executive and senior leadership roles, they will rely on creating influence and learning how to lead through people to ensure adequate technical expertise exists and is used and that adequate management systems are in place to ensure maximum effective use of the technical expertise to create high quality, profitable products and services. Each of these career developments requires letting go of how one has been successful and learning how to use what they know at the next higher level of system. Otherwise, the executive is destined to less effective results and potentially failure. 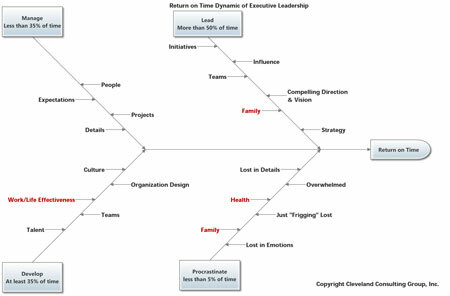 The return on time diagram was developed to shift the focus of executives or executives being groomed to understand the transitions required at the highest level. By now you've probably realized that for an effectiveness work/life formula to be developed, the individual must include work/life effectiveness as a part of the constant mindset. He or or she must also focus on how to lead his family in defining their dynamics including the level or commitment to each other surrounding time in the form of attending children's events, family functions, etc. In addition, the executive must spend less than 5% of the time not doing anything about one's health, family or friends. To support my clients, I focus on effectiveness in work and life. Clay Christiansen highlights this same concept in his book "How will you measure your life." I use effectiveness because executives relate better to effectiveness than work life/balance. I encourage family conversations to define successful work/life effectiveness. Most family members have a life of their own. They simply want you, the executive, to be in it. For example, it is astonishing how many executives get to the latter part of their careers and state "I never knew" when provided feedback as the spouse and children move out or wonder why the client wants a relationship after all of these years. Nothing replaces conscious presence with family, friends, and one self to measure one's life. Using one's skills surrounding technical and management systems applies to family, friends and oneself. Learning about family and friends requires being relational and interested and fully present. In setting up internal systems to manage these relational systems, in particular, your involvement is critical. I am pleased that more executives are seeking work/life effectiveness. It is reflective of the client noted in the first part of this issue. When he re-evaluated how he was managing and perceiving/valuing his time, he found the return to be less than he would expect for his career. Hence, he changed his priorities by reviewing the above diagram frequently and by putting family, friends, and health related issues into his calendar. When other executives attempted to leverage his calendar, he held fast. In time, other's accepted his priorities without adding negative undercurrents that he is not committed to his job or the company. In fact, the CEO opened a conversation of how he got his work effectively done and still found time for these other activities. He noted that he wanted more work/life effectiveness.